In comparison with many other developing countries, Iraq has unprecedented economic possibilities. It has enormous agricultural potential, thanks to the water and the fertile silt deposits from the Tigris and Euphrates. The size of the population (estimated at around 30 million in 2010) guarantees an ample supply of labour. Also very important are Iraq’s extensive oil reserves (about 10 percent of the proven world reserves) and gas reserves (Iraq ranks eleventh in the world), on the income from which the nation is almost totally dependent. In 1989, the year before the United Nations trade embargo was established during the Kuwait crisis, crude oil generated 98 percent of the export revenues and covered 90 percent of the government’s budget. On paper, the great strength of Iraq’s economy lies in the combination of these factors. With the exception of Iran, no other country in the Middle East can be said to have this potential. But the Iraqi economy also has vulnerabilities. For instance, both the Tigris and Euphrates rise in Turkey, and before the Euphrates reaches Iraq it also runs through Syria. Since the mid-1970s both Turkey and Syria have been building large dams on the upper reaches of the Euphrates, with the intention, among others, of making more land arable through irrigation. This has resulted in decreased water flow downstream, which harms Iraqi farmers. Iraq depends almost entirely on neighbouring countries for the transport of goods in and out; it has a coastline of only 58 kilometres (on the Persian Gulf). Under stable political circumstances, these problems could be dealt with. The water problem could, for example, be solved by digging canals and entering into agreements with Syria and Turkey. (To date, negotiations on the basis of international regulations have not produced a satisfactory result.) The supply of water could then be regulated as far as possible in order to make optimal use of it. The problems that arise from Iraq’s landlocked situation could be overcome by being on good terms with its neighbours and by developing alternative transportation routes (roads, pipelines, railway lines). The dependence on income from the oil sector could be reduced by broadening the economic base. Although past attempts to overcome these economic limitations have been made with varying success, Iraq remains extremely sensitive to external developments. That the Iraqi economy is presently in such difficulties can be attributed primarily to the penchant of the regime of Saddam Hussein for seeking violent solutions, resulting in three devastating wars within twenty-five years. The Iraqi economy is facing in the last years several great challenges, such as the receding of oil prices in the years 2015 and 2016 and the emerging of ISIS organization. The Iraqi government is facing numerous challenges; among which is preserving the macro-economy of the country; conducting structural reforms to improve the level of public services; restructuring the infrastructure in the areas which were liberated from ISIS; and providing aid for about 3.4 million Iraqis who are internally-displaced from the areas of the conflict with ISIS organization. As a result of the extreme challenges which Iraq is facing and its need for large funds, the International Monetary Fund had agreed in July 2016 to provide Stand-by Arrangement (SBA); its period is three years and with a value of 5.34 billion US dollars, simultaneously with the World Bank providing a series of three loans for the purposes of development with the value of 3.2 billions dollars between the years 2015 and 2017. As well the Ira donor conference pledges in July 2016 to provide 2.1 billion dollars between the years 2016 and 2018, with the aim to secure financial support for the difficult humanitarian situation in Iraq. The gross domestic product (GDP) in the year 2015 had reached 180.07 billion US dollars, in comparison with 228.73 and 324.65 billion dollars in the years 2014 and 2013 respectively. In the year 2015, the GDP per capita had reached 5820 US dollars, in comparison with 6560 and 6840 dollars in the years 2014 and 2013. According to the International Monetary Fund, the inflation rate in the years 2015 and 2014 had reached 2%, in comparison with 1.4% in the year 2013. It is predicted that the Iraqi economy will grow in the year 2016 by a rate of 4.8% due to the increase in oil production. 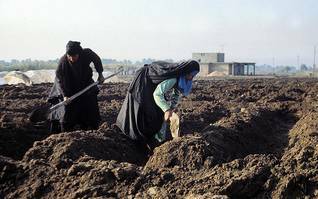 About a quarter of the total land area of Iraq is suitable for intensive cultivation and animal husbandry. A considerable part of that lies in the hilly and mountainous north, in Iraqi Kurdistan. The annual precipitation in this region is large enough to make agriculture possible without irrigation. 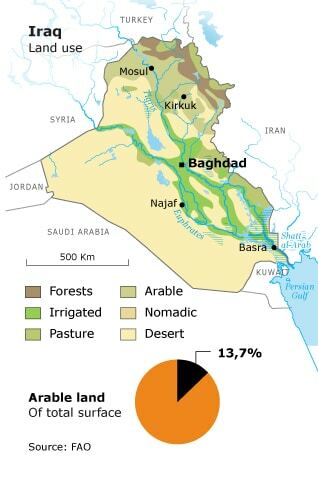 Iraq’s most important agricultural land, however, lies in the plains south of Baghdad, where it is irrigated from the Tigris and Euphrates. Throughout history, the region that is now known as Iraq derived its wealth from agriculture, thanks to the existence of a complex and widespread irrigation system. After the destruction of the irrigation system by the Mongols, still more areas were lost to production as their poorly drained soils were poisoned by salts deposited from evaporating irrigation water. By the 19th century, much of the once fertile Mesopotamia was inhabited by nomads, who used the land to graze their herds. the UN embargo, and, over recent years, lower levels of precipitation, and the growing frequency of dust storms from the Arabian Desert, have put additional strains on the agricultural sector. The regime of Saddam Hussein presented a new economic approach. Following the developments elsewhere in the Middle East, but chiefly under the pressure of economic problems that arose from the war with Iran, the role of the central government in the economy diminished, beginning in the mid-1980s. The privatization of agriculture was carried out rigorously; cooperatives and state farms were dismantled. In this way, Baghdad hoped to increase productivity in this sector. 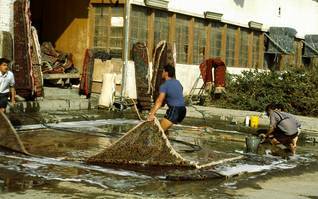 After 1985 this process was extended into other sectors of the economy, with the exception of the all-important oil industry. In two years a series of state-owned firms in heavy industry and food processing came into private hands, often the hands of those who had excellent connections within the regime. The first joint ventures with Asian and Western European firms were established, and Baghdad opened a stock market. In 1988 price controls on foodstuffs were abolished, which quickly led to sharp price rises. 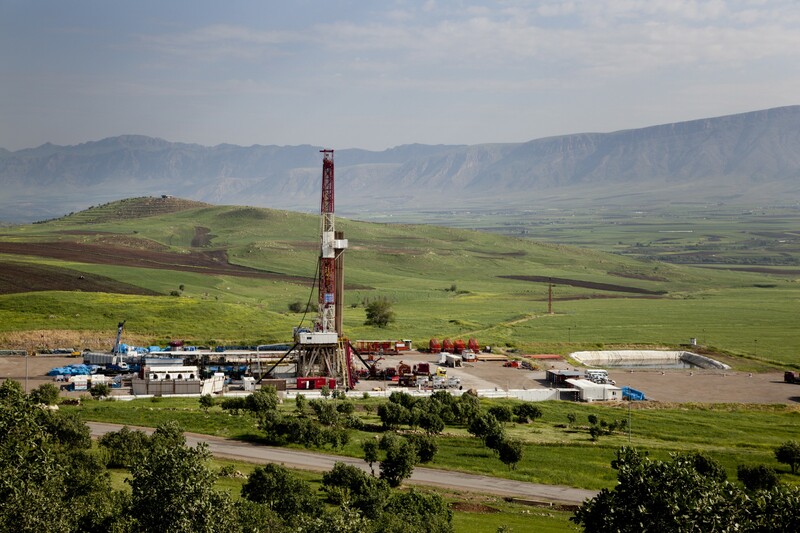 For an in-depth overview of Iraq’s energy sector click the button below. The sharply rising oil incomes also provided a powerful stimulus for the service sector. Even under the Baath regime, internal commerce remained in private hands, though foreign trade was controlled by the state. Western Europe, Japan, and the United States were the most important customers for Iraqi oil in those years and, after the oil boom, also supplied most goods and services. The share of the Eastern Bloc rose in the 1960s but stagnated in the 1970s. The Soviet Union nevertheless remained Iraq’s largest weapons supplier during the war with Iran. Investment in welfare and education was responsible for a large part of the growth in the service sector. From the mid-1970s on, Iraq had nearly free health care and free education up through university level. In 1979 a large-scale and successful literacy programme began. Older Iraqis remember how, thanks to the increase in oil revenues, their standard of living rose in the course of the 1970s. 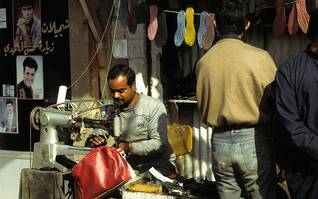 The Iraqi economy has suffered from the devastating wars it waged. The turning point was the war with Iran, which began in 1980 and dragged on for eight years. As an extension of the war, a far-reaching militarization of the Iraqi economy took place. The budget was largely swallowed up in waging the war and in military purchases. Towards the end of the war, Iraq had almost a million men under arms. During the early years of the conflict, Saddam Hussein’s regime did everything it could to protect the civilian population from the negative economic effects of the war, in a guns-and-butter policy. They were able to do so thanks to the monetary reserves Iraq held on the eve of war, estimated at about 35 billion dollars. As the war dragged on, and certainly after Syria shut down the pipeline across its territory in 1982, the regime began to feel the pressure economically.Wealthy neighbouring states, such as Saudi Arabia and Kuwait, which feared an Iranian victory, provided extensive financial support in those years, and the West, Japan, and the Eastern Bloc came to Baghdad’s aid, with credits. With the construction or expansion of capacity in oil pipelines via Saudi and Turkish territory, oil income again rose. All of this enabled Iraq to continue its war efforts. In 1988, Iraq came out of the Iran war penniless. The economy had run aground; there was no work for the many demobilized soldiers, despite the departure of the Egyptian guest-workers. (They fled the country in massive numbers after a series of violent attacks against them, generally leaving behind the money they had saved.) The purchasing power of the population fell by about a third from 1980 to 1988, and Iraq was saddled with a massive foreign debt: 21 billion dollars in total to Western European countries, the US, Russia, and Japan, and 48 billion dollars to Saudi Arabia, Kuwait, and other Gulf states. 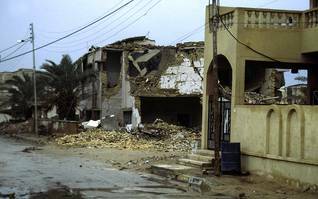 Saddam Hussein’s attempt to solve the pressing economic problems by essentially committing a bank robbery of his rich neighbour Kuwait in August 1990 resulted in the devastating war with the anti-Iraq coalition. 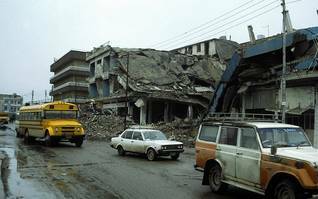 The weeks-long bombardment of Baghdad and other parts of Iraq caused extensive damage to the infrastructure: according to a United Nations report, Iraq had been bombed back into the pre-industrial era. Moreover, after the end of the war Kuwait, foreign companies, and individuals filed damage claims. These raised the already massive debt of Iraq to at least 200 billion dollars. After 1996, 30 percent (later 25 percent) of the revenues from the Oil-for-Food Program were freed up to meet the first of these claims. In order to force Iraq to cooperate in the dismantling of its arsenal of unconventional weapons, the comprehensive United Nations trade embargo that had been imposed after the Iraqi invasion of Kuwait was continued in full force after the crisis. In the years that followed, this led to massive impoverishment in Iraqi society, of which the staggering death rate among children was a symptom. Fearing the political repercussions of massive starvation, Baghdad in 1996 agreed to the Oil-for-Food Program, which had been set up the previous year, under the aegis of the UN. Since then, every citizen of Iraq has received a free basic food packet from one of thousands of distribution points spread across the country. The packet contains flour, rice, sugar, cooking oil, soap, milk powder, and other items, but hardly any additional protein sources. It covers minimal nutritional requirements for the first three weeks of the month; the rest needs to be supplemented by income from the recipients themselves, which is almost impossible for many because of the high unemployment. About 60 percent of the population was completely dependent on this food distribution for survival in the years of the embargo. Although the economic problems in northern Iraq (Iraqi Kurdistan) were serious, life there began, during the 1990s, to be better than that in central and southern Iraq. Among the reasons for this were the smuggling of oil products from Baghdad to Turkey and extensive aid programs run by Western aid organizations. Moreover, after 1996 the region received 13 percent of the revenues from the Oil-for-Food Program. Finally, the many Kurds in the diaspora helped the family members left behind to get through these difficult years. After the fall of the Saddam Hussein regime, Washington undertook a fundamental restructuring of Iraq’s economy, in violation of international law, which denies an occupying power this authority. In imitation of the economic ‘shock therapy’ previously applied in Eastern Europe, the economy was completely opened up, the role of the state minimized, and the free market given unrestrained play. Official rhetoric notwithstanding, Operation Iraqi Freedom was inspired primarily by economic motives and geopolitical considerations closely related to them. At stake was the conquest of a market which had until then been closed to the United States, in a country that possesses one of the largest oil reserves in the world. This became clear soon after the fall of the regime of Saddam Hussein. On the basis of decrees issued by Paul Bremer, the head of the Coalition Provisional Authority (CPA), steps were taken to transform a government-guided economy into a free-market economy. Unprecedented favourable conditions were created for foreign (i.e., primarily US) capital. For instance, with the exception of the energy sector, the entire economy was opened up for foreign investment; foreign investors can set up businesses without a permit and without a local partner, and there is no requirement to reinvest even a portion of the profits in Iraq; import tariffs were eliminated and replaced by a tax of 5 percent for financing reconstruction; the maximum income tax rate was reduced to 15 percent. This policy, which led to considerable social polarization, ran into resistance from Washington’s Iraqi partners, whereupon the plans were modified though not abandoned. Although the Oil-for-Food Program formally ended in late 2003, the distribution of basic food packets has continued, anxious as Washington and the new Iraqi government are about the political backlash that stopping the program would provoke. As a result of UN Security Council Resolution 1483 (22 May 2003), the UN trade embargo, which had been in force since August 1990, was ended. All of Iraq’s frozen funds in foreign banks, together with proceeds from the Oil-for-Food Program which had not yet been spent, plus all oil revenues generated after 22 May 2003, were deposited in the Development Fund for Iraq (DFI). This fund was managed by the Coalition Provisional Authority (CPA) until 28 June 2004; a twelve-member Program Review Board controlled the expenditures. Although this was Iraqi money, Iraqis formed a minority on the Board. On the eve of the installation of the Interim Government on 28 June 2004, nearly the entire DFI reserve had been spent. Large US corporations such as Halliburton and Bechtel received enormous orders, without competitive bidding. In the absence of adequate audit control, this led to waste of financial resources and fraud. After 28 June 2004, the role of the CPA was taken over by the US embassy; with about 3,000 staff, it is the largest US embassy in the world. It had at its disposal the vast majority of the 18 billion dollars that the US Congress appropriated in October 2003 for reconstruction. Even after the formal transfer of power to the Interim Government on 28 June 2004, the United States was able, from its position of power and influence, to push through the further restructuring of the Iraqi economy and acquire a strong if not dominant position in a potentially rich market. Economic recovery was only conceivable if Iraq found relief for its huge debt. It was thus one of Washington’s priorities, working through the Paris Club (an organization of wealthy nations), to gain remission of 90 percent of the debt, arguing that the Iraqi people should not be paying for generations for the irresponsible policies of a dictator (the so-called ‘odious debt’ principle). This remission has not yet been granted. A second condition for economic restoration was that there be large-scale investment in reconstruction and development, particularly in infrastructure, which had been destroyed or badly damaged. The World Bank had already calculated that 55 billion dollars would be necessary. Priority should go to the oil sector, so that Iraq could begin to finance further reconstruction from its own resources as quickly as possible. Until that point is reached, Iraq will be dependent on financial support from the international community. A large donor conference in Madrid in October 2003 produced pledges of 33 billion dollars,18 billion of it from the United States. The donors have made good on only small portions of their pledges since then, because of the undiminished dominance of the United States in Iraq. Washington soon had to pour in large sums of its own to keep the reconstruction on track. The third condition for economic restoration was that peace, as well as law and order, should be restored. Although economic recovery would have been difficult in any case, things became even worse after 2003, due mainly to the insurgency, which targeted not only foreign forces and Iraqi government officials and facilities, but also economic facilities such as oil pipelines. In addition, after the bombing of the Golden Mosque in Samarra in February 2006 sectarian violence soon escalated to unprecedented levels, and many thousands of civilians were killed. About four million others were displaced within Iraq or ended up as refugees in neighbouring Arab countries. Among them were many well-trained people who could have made a valuable contribution to the recovery of the economy. Kurdish authorities (Kurdistan Regional Government, KRG) allowed Arab businessmen and highly skilled technicians to transfer their economic activities to the Kurdish provinces, but their number was limited.From the end of 2008 on, due to a combination of factors (see Chaos subsides), the level of violence did gradually decrease, except for a spike from August 2009 until 2011, when it levelled off again. American troops left Iraq at the end of that year.